You will be given a reference e-book to read which has 234 pages And the test will be based on that e-book , you can take the test only after 10 days Of &nbsp;purchase. Project planning is a position in which one or many individuals are in charge of devising the methods, resources and budgets require in order to accomplish a specific goal or project completion. This is a discipline that involves many complex business concepts such as chart development, logistics, finances and various aspects of office culture when it comes to dealing with employees. There are a great many different methodologies used in the act of project management, and no specific one is superior. As a result, many techniques are often taught in abridged form in a project management course. Students are often encouraged to also learn effective and dynamic ways to blend the various attributes of tried and true methodologies to best meet their own managerial techniques and the demands of any given project. Endeavoring to become certified in project planning has multiple benefits. For those who find themselves on board on a project, or being passed up for promotion due to their inability to spearhead a project, this could be the key to that promotion and advancement and career. For those who have an idea for some project, either in their business or in their personal lives, but can never seem to find that missing something to make the project possible and seen through, this is also a key to solving that problem as well. Given the complexities of modern business and industry, people with a skill in project management are in increasing demand, and this demand is only going to continue increasing in the future. It takes a special kind of person to take an interest in project management, one who is eager, willing to work, and not afraid of responsibility – thankfully, there are many people with that mindset in the world. There is a difference, however, between having the right mindset, and having the right education. This is why a project planning certification is necessary to be truly qualified for such a responsibility. The best place to acquire a project planning certification is through an online certification provider. Online certification is an excellent tool for busy adults. Eliminating the classroom, hectic schedules and tuition costs, and adults can learn at their leisure, while their professional and personal lives are not intruded upon in any way. An online certification provider can provide a competent project planning course for anyone who is too busy to go back to school, or simply doesn't like classrooms. There are a surprising amount of people who genuinely dislike the classroom environment – in fact, pretty much a majority. When choosing an online certification provider, it's important to bear in mind that like with any competitive industry, some are better than others, and there has to be a best. 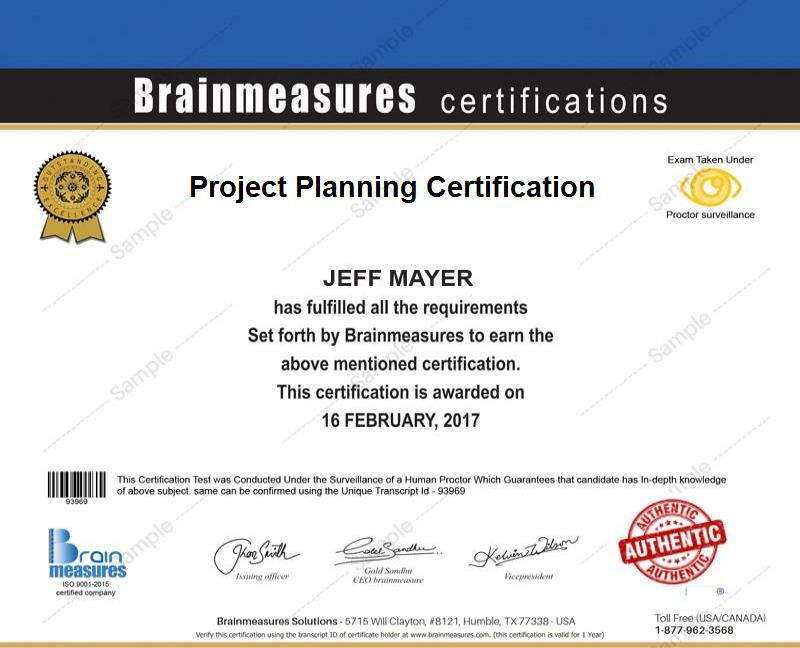 Brainmeasures is the best online certification provider available. We use a unique teaching methods, incorporating not only the guidelines of ISO certified professionals, but we also integrate their experience, of which they all have years. We use this experience as context for conveying the information we teach, which not only makes the material relatable to the student, but also imbues them with a level of experience that people starting out sell have. This makes Brainmeasures a unique company, and our students the best and most ready out there. This project planning course consists of a lesson series, followed by an online exam. Upon completing the online exam, a skill certificate is awarded, which signifies a full project planning certification, the best one available. A skill certificate from Brainmeasures speaks 1 billion words about the individual who holds it, and employers know this! These professions can vary widely and potential earnings, depending on the company, specific field, and economic climate. However, salary for these positions show a range between $102,000, and $405,000, with many numbers in between.